Good library. Easy to use and inspirational. Excellent sound. Good effects. Limited audio export. Auto-slicing could be better. 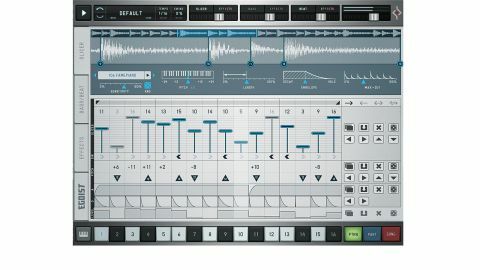 At the top of the interface, the Header bar features a global preset browser, the tempo setting (determining the sequencer step resolution - 1/4, 1/8, 1/16, 1/32 and triplet values), a swing control and a few section controls for Slicer, Bass and Beat (on/off, volume and Effects on/off for each). "The headline creative feature of Egoist is the Slicer, which comes with a collection of samples and lets you import your own"
The headline creative feature of Egoist is the Slicer, which comes with a collection of samples and lets you import your own (AIFF, WAV and MP3). You can set loop ranges for the sample, auto-slice it (up to 16 slices), manually set slice points, control the pitch of the entire loop (+/-24 semitones), set the global length of the slices, tweak the global envelope, apply limiting and more. It's all simple but effective stuff: the goal with Egoist is clearly speed over complexity, although there's plenty of scope for refinement in future versions. The Slice Arranger couldn't be more straightforward. Each sequencer step has a slider for setting the slice to be played, slices can be played backwards or forwards, and the overall loop length can be adjusted. You can also deactivate individual slices for gating effects and shift their pitches up and down up to two octaves either way, while a basic amplitude envelope for each step offers adjustable Level, Attack and Decay. Egoist is one of the most intuitive pieces of software we've ever used, but randomise functions nonetheless pop up throughout the interface. There are four for the Slicer page (global, arranger, pitch and envelope), three for the Bass/Beat page (bass note length, bass note value and drum pattern), two for the Effects page (pattern and effects settings), and one for the Pattern/Part/Song settings. The Bass instrument is a beefy, no-frills monosynth with three low-pass filter types modelled on the Korg MS-20, Roland TB-303 and Moog, an LFO and overdrive. Its sequencer enables a selection of preset note lengths, ties and glides, and per-step transpose, all programmed in a clever three-lane interface. The whole thing delivers a range of impressively 'big' classic sequenced bass sounds. Under the bass synth sits the Beat generator, giving access to a range of sample-based drum kits, with another simple three-lane sequencer triggering kick, snare and hi-hat (open and closed in the same lane) sounds. You can tune individual drums and tweak their tone and envelope shapes, but while there are some nice sounds here, don't expect it to take the place of your dedicated drum machine or sampler. Much like Sugar Bytes' Effectrix glitch effects matrix plugin, Egoist's Effects section hosts seven 16-step lanes, each acting as a trigger for one of the seven effects modules: Looper, Stop, Chorus, Lo-Fi, Reverb, Delay, Filter (seven types, including low-pass, high-pass, band-pass and comb), each with its own decidedly quirky GUI. As you would expect from Sugar Bytes, they all sound great. While we reckon most people will use Egoist as a groove-making tool, it does have live performance and deeper composition potential, too. The Footer section offers three arrangement modes, in which three 'levels' of composition are handled. Patterns are the basic building blocks of Egoist grooves (you can have 16 per preset, either sequenced or triggered via MIDI), Parts are sequences of Patterns, ideal for building verses, bridges and choruses (Egoist can hold six of them - triggered by any MIDI note - each of which can comprise up to eight of the loaded Patterns), and Songs are arrangements of up to 16 Parts. Combining these three 'levels', you can construct basic song structures and trigger parts on the fly. "Being such great fun to use, it'll likely be something you revisit over the years"
There's a lot more to Egoist than we've talked about here (including such niceties as individual fine-tuning controls and a global limiter in the setup page), but there are also a couple of things we'd like to see added. It would be great to be able to quickly export individual parts as audio files, from both the plugin and standalone versions; and multiple audio outputs would make integrating your Egoistical ideas into DAW projects much easier. Egoist has a very distinctive sound (the Bass and Beat sections) and vibe (imparted by the Slicer and Effects), so while it might only have a shelf life of a few months as your primary track-sketching tool, being such great fun to use, it'll likely be something you revisit over the years, so we think it does represent good value. For any electronic producer looking for inspirational song-starting ideas and a fast, easy workflow, it comes highly recommended.